TSH offers a wide variety of wheelchairs for rent on a weekly or monthly basis. We carry a full selection of wheelchairs including standard lightweight, reclining, transport and heavy duty models. Most are available today for your immediate rental needs. Like all of our rental products, wheelchairs can be picked up in-store or delivered direct to your home or wherever you need it. Our standard wheelchair is a traditional wheelchair with large rear wheels and small front wheels and made to be light and easy to carry. Our standard wheelchairs easily fold for transport in your vehicle. All Wheelchairs include removable leg rests. Elevating leg rests are an available option. 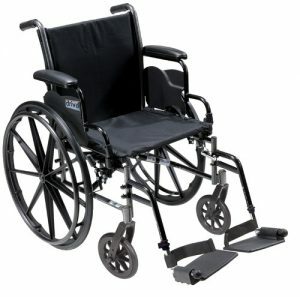 Our lightweight wheelchairs are available in 18″, 20″, 22″ and 24” seat widths and have a weight capacity of 250 lbs. 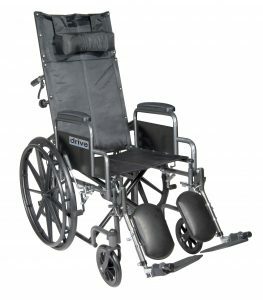 Our lightweight transport wheelchair is a used for patient transport where the patient will not be self propelling. 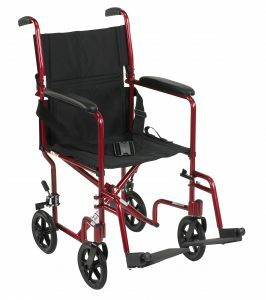 Transport wheelchairs feature much lighter weight (19 lbs) and small wheels at all four corners. Transport chairs fold easily for transport in your vehicle and include removable leg rests. In addition to the features found in a standard wheelchair, The reclining wheelchair includes one key feature: the capability to adjust the backrest into a reclined position for added comfort. This feature is especially important to users who find it difficult or impossible to sit in a fully upright position and users who sleep in their chairs frequently. For those that are looking for a more portable chair, however, the reclining wheelchair may not be a great fit. When compared with a similar, non-reclining chair, a reclining wheelchair tends to weigh more (55 lbs). Reclining wheelchairs include removable elevating leg rests and can fold for transport in your vehicle. With weight capacities of 500 pounds and seat sizes up to 24 inches, heavy duty wheelchairs (often referred to as extra wide wheelchairs or bariatric wheelchairs). 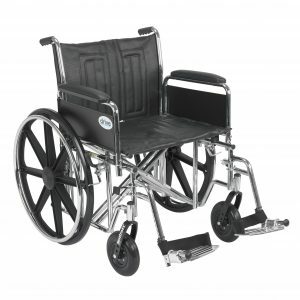 Our heavy duty wheelchairs are available in 22” or 24” seat widths and weigh about 55 lbs. They include heavy duty removable leg rests and heavy duty elevating leg rests are an available option. These chairs can fold for transport in your vehicle. Often overlooked by most renters, the all important ramp. While our rental wheelchairs make getting around a breeze, don’t forget additional transport needs, like rolling into your home. Our ramp rentals are affordably priced and the perfect compliment to any wheelchair rental.